If you’re a business owner, you probably strive to please your clients and employees. Part of that job is ensuring that your building is structurally sound and doesn’t damage the health of the people who work in it. Most commercial buildings contain a flat roof. Unfortunately, flat commercial roofs are more likely to suffer from ponding water than buildings with sloped roofs. Also known as standing water, ponding water occurs when water accumulates, usually in low-lying places, after at least 48 hours, when it should have evaporated. Although your roof may be in good shape, standing water can still be a huge concern. When ponding water is ignored, several problems can arise that can compromise the health of humans and pets as well as affect the integrity of a roof. Here’s what you need to know about how ponding water can lead to mosquitoes and other damaging side effects. Ponding water on a flat roof can be a favorable breeding spot for female mosquitoes to lay their eggs both in the water and around it. These insects are detrimental to health as they carry malaria, yellow fever, eastern equine encephalitis and other severe diseases. Besides hurting humans, mosquitoes can also transmit heart worms and tapeworms to dogs. Flies and dragonflies, which also pass on many diseases, tend to breed in standing water. Because standing water isn’t generally disrupted by people, it’s easy for insect larvae to develop into adults. Algae and vegetation, along with mold and mildew, can grow in ponding water. When mold and mildew develop on your flat commercial roof, they can present a serious health hazard to your business, affecting your customers and employees. Furthermore, algae can damage a roofing membrane by washing into your roof’s drainage system. This can lead to clogged drains and create even more standing water. 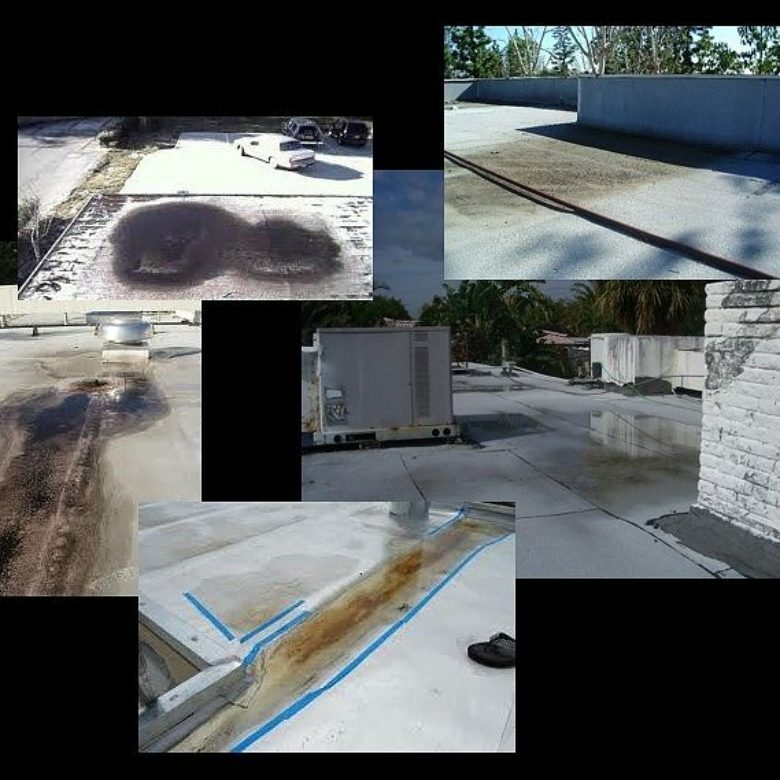 In addition, contaminants, such as dirt and debris, can accumulate in standing water, which can damage the surface of a roofing membrane over a period of time. 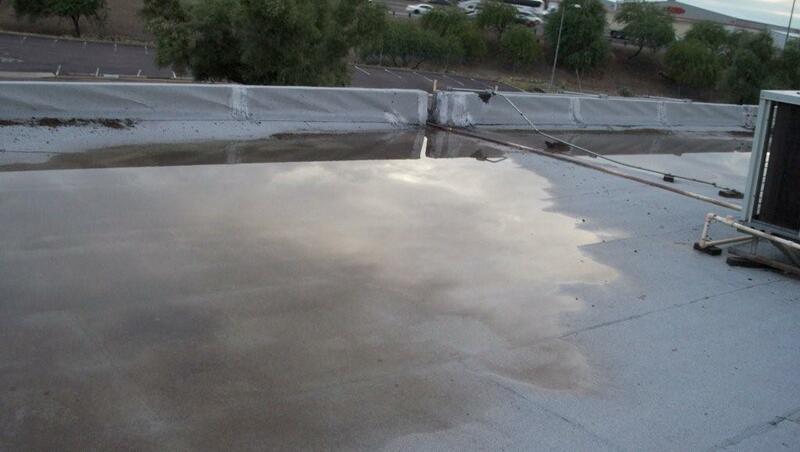 Water that gathers on a flat commercial roof can cause damage to the surface of the roof. Consider how standing water can intensify harmful UV sun-rays, which can cause the roofing membrane to age prematurely. This results in cracking, splits and mineral loss. 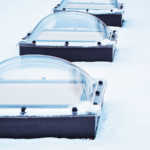 What’s more, with freezing weather, ice can accumulate, moving across the surface of a roof. This creates a significant amount of physical damage. The more standing water that accumulates on your roof, the greater is the amount of weight your roof has to bear. Sometimes, the weight of standing water can be so heavy that it can even lead to the roof collapsing. Keep in mind that an area of ponding water that’s just 200 square feet can add an extra 1,000 pounds to a roof. In addition to causing damage to roofing equipment, this problem can even lead to human fatalities when a roof collapses. It only takes a small amount of moisture to get underneath a roofing membrane to weaken the thermal resistance of roof insulation. It’s important to regularly inspect your roof, at least once a month, to avoid problems with ponding water. When standing water becomes problematic, call an experienced roofing specialist. Standing water can sometimes be hard to notice. This is because a rooftop can get in the way from ponding water being viewed the way it needs to be seen. One way to spot ponding water is to stand in the middle of a street, after rainfall has occurred. When standing in the street, see if you can detect any reflective water patches. In some instances, standing water can form in the valleys of a pitched roof, but it’s mostly formed in flat roof sections. Ponding water can be caused by factors, such as improper roof sloping, algae, vegetation, temperature changes and debris that blocks water passage. It can also be the result of leaking cooler lines and pans, besides other water sources. 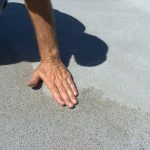 One of the main causes of ponding water is low-lying spots on a flat roof. At RoofSlope we have a special product that can correct this problem. 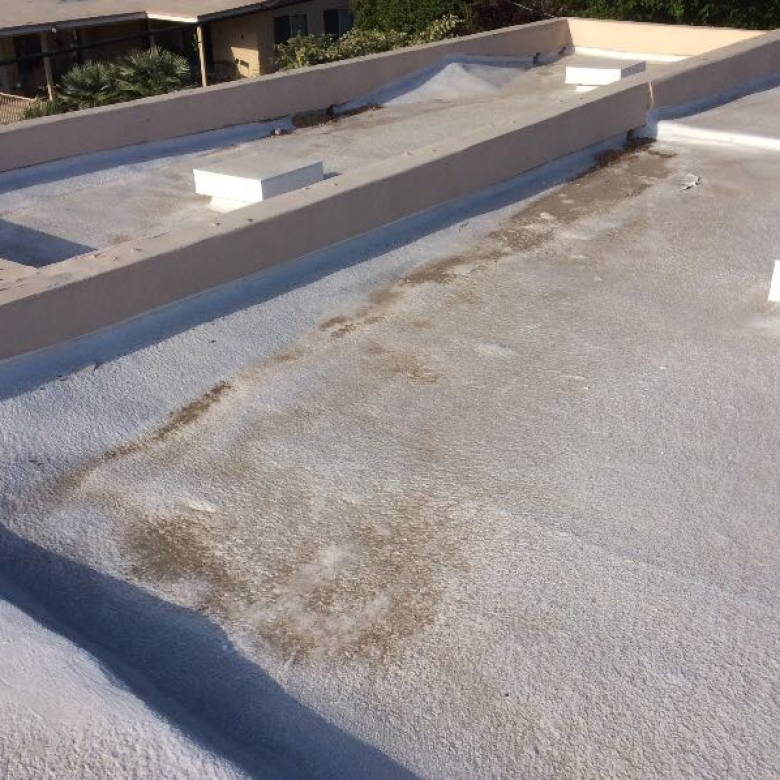 Please contact us and learn more about how we can fix this common condition that occurs on flat commercial roofs.